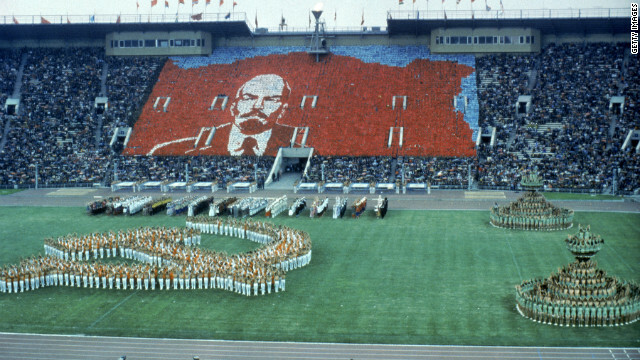 Picture of the opening ceremony in Moscow. On January 20, 1980, President Carter announced that “[u]nless the Soviets withdraw their troops within a month from Afghanistan,” that the US would boycott the Olympic games that year in Moscow. The media, including the Washington Post’s Robert G. Kaiser, supported the boycott, arguing, “the collapse of this Olympiad would send a genuine shock through Soviet society,” though CIA Director Adm. Stansfield Turner warned that such a stunt would backfire. Declassified documents, including the confidential memo featured in today’s posting, help contextualize the Carter administration’s final decision to boycott the games in the hopes of preventing Soviet expansion into Afghanistan. The confidential January 30, 1980, memorandum from William E. Simon, Treasurer of the US Olympic Committee (USOC), to Marshall Brement, Honorary President of the USOC, encapsulated the Carter position on boycotting the games. 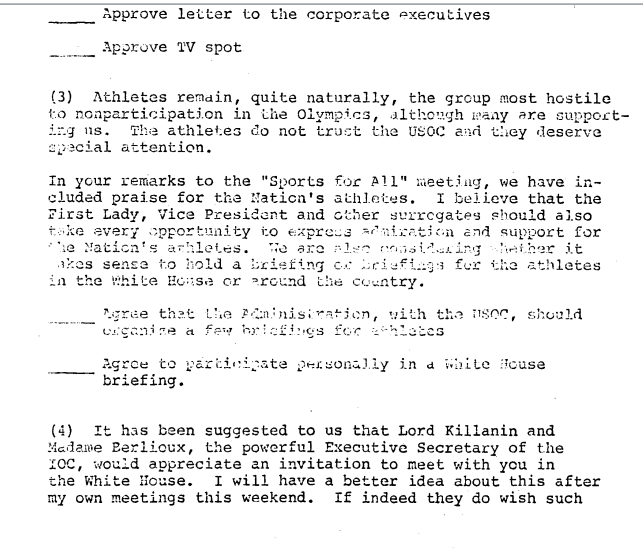 In the memo, which is part of the Digital National Security Archive’s “CIA Covert Operations, 1977-2010” collection, Simon wrote that while the majority of the US Olympic Committee felt that “pressure from the President and the Congress forced them to take their position” to boycott the games, he remained confident they would come to embrace the official USOC position “a little more enthusiastically” in the weeks to come. Simon’s belief was no doubt buoyed by the boycott’s popularity with the American public, nearly 55% of whom were alarmed by the Soviet Union’s first attempt at territorial expansion since the end of WWII and supported the protest. The Soviets defied Carter’s January 20 Afghanistan ultimatum and the US followed through on its threat, leading 65 countries in a boycott of the 1980 games and sending their athletes to an alternate event instead. 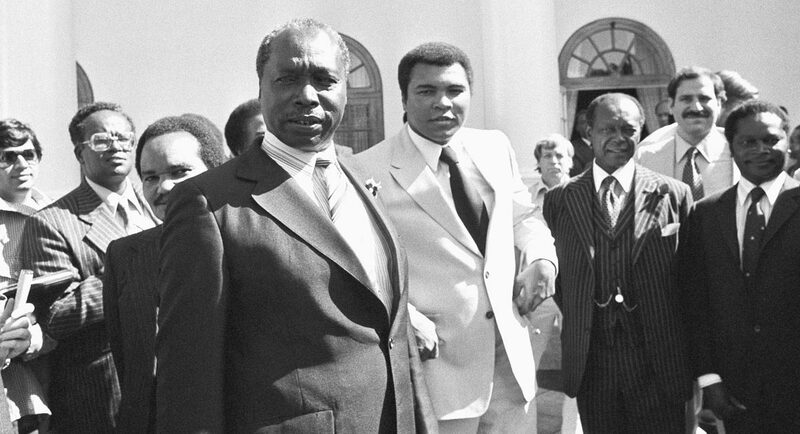 Carter initially wanted the alternate games to take place in Africa, hoping to “encourage developing countries that were not aligned to either superpower to join the boycott of the Moscow games and offer Western athletes – who were largely skeptical of a ban – the chance to compete in an alternative event.” The President even sent Muhammad Ali on an African tour to promote the boycott and solicit countries, including Tanzania, Kenya, and the Ivory Coast, to consider hosting the alternate event. Ali’s trip was ultimately unsuccessful, and the “Boycott Games” ended up being held in Philadelphia with mixed results, since many countries officially boycotting the Olympics still allowed their athletes to compete in Moscow under the international flag. Carter’s insistence on boycotting the games prompted some in the Kremlin to wonder if he was emotionally unstable, and Anatoly Dobrynin, the Soviet Union’s ambassador to Washington, later said of the boycott, “I had never encountered anything like the intensity and scale of this one. What particularly caught my attention was the president’s personal obsession with Afghanistan.” In the end, CIA Director Adm. Stansfield Turner’s prediction that boycotting the 1980 Games would backfire proved correct, and the Soviet Union retaliated by boycotting 1984 games in LA, due to “chauvinistic sentiments and an anti-Soviet hysteria being whipped up in the United States,” and, more importantly, remained in Afghanistan for nearly another decade. For more declassified documents on the Carter administration, the 1980 Olympic boycott, and US-Soviet relations, visit the Digital National Security Archive. ← FRINFORMSUM 2/13/2014: Top Pentagon Official Ordered Destruction of bin Laden Death Photos, NSA Employee Gave Snowden Password to Classified Info Network, US Falls in Press Freedom Rankings to #46, and Much More. Reblogged this on Communications & Legal Studies.